After recognizing the advantages of these additive manufacturing processes, industry now also views them as a major opportunityfor efficient mass production of complex or individualized parts. 3D printing has to clear some hurdles before it can go into more widespread use.One key issue is the lack of suitable materials. While over 3,000 materials are available for conventional component manufacturing, only about 30 are available for 3D printing. “We market products with a variety of properties like toughness and heatresistance as well as transparency and flexibility that support a number of new applications,”said Dr. Markus Steilemann, Chief Innovation Officer at Covestro. “Covestro's efforts will make a key contribution to advancing the use of 3D printing in industrial mass production. We believe the material data now need to be integrated into the software used on 3D printers so that component structures can be further optimized,” Steilemann said. 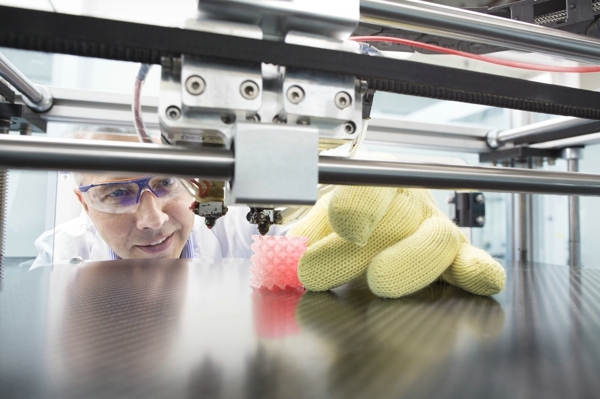 For this purpose, Covestro recently opened a new laboratory for 3D printing at its headquarters in Leverkusen. The lab will soon be receiving additional equipmentand is used by the company and its partners to develop material solutions and test them under practical conditions.The Covestro competence team for additive manufacturing has extensive know-how in the processing of materials using common 3D printing technologies. Covestro offers a broad choice of filaments for the FFF process, from flexible thermoplastic polyurethanes (TPU) to high strength polycarbonate (PC). Covestro TPUis very well suited for additive manufacturing thanks to its excellent abrasion resistance and elasticity. Typical applications are sports, footwear or automotive. Covestro also offers TPU powdersfor selective laser sintering (SLS), in which a laser beam is used to sinter the material. Spatial structures are thus created layer by layer. TPU displays significant advantages over materials commonly used in SLS, which tend to be less tough and elastic. TPU powders are already used in the industrial production ofindividualized high-perfomance soles for shoes, for example. Those productsare formulated and commercialized at key footwear OEMs by Covestro's partner Lehmann&Voss&Co. These PU-based resins offer the unique opportunity to customize performance (toughness, flexibility, chemical & weathering resistance) due to the broadrange of isocyanates and polyols from Covestro.This chemistry will enable customization of object properties at the voxel level, for example tocreate gradient materials. With 2015 sales of EUR 12.1 billion, Covestro is among the world's largest polymer companies. Business activities are focused on the manufacture of high-tech polymer materials and the development of innovative solutions for products used in many areas of daily life. The main segments served are the automotive, electrical and electronics, construction and the sports and leisure industries. Covestro, formerly Bayer MaterialScience, has 30 production sites around the globe and as of the end of 2015 employed approximately 15,800 people (full-time equivalents). This press release is available for download from the Covestro press server at www.covestro.com. Photos are available there for download as well.